S1058, Gold Color, Scroll Invitations, Jewish Invitations, Box Scrolls, Cinderella Wedding, High End Scrolls. The scroll has hot foil printed gold border on both sides. 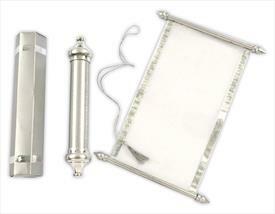 It is contained in a beautiful handcrafted plastic container having matt gold swirls and shiny golden knobs. Case goes into a golden hexagonal box. 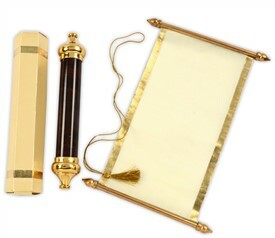 Scroll in translucent wooly paper (60gsm) with golden bar and golden zari tassel. 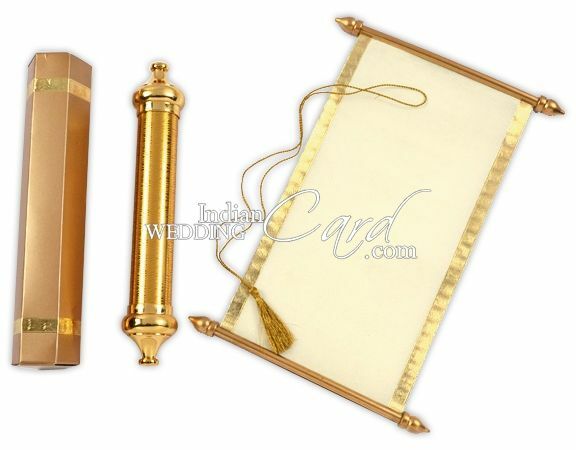 Golden color handcrafted plastic case; Matt finish gold color metallic paper (250gsm) for outer mailing box.